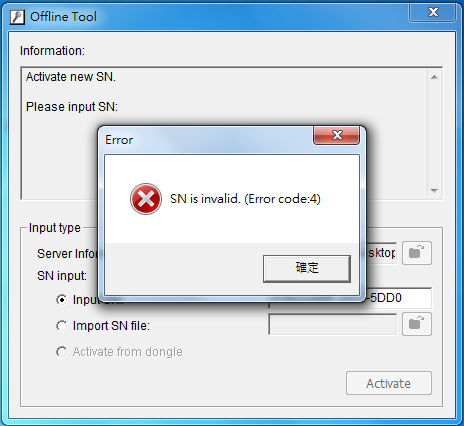 After clicking on "Activate" button in "Offline Tool", an error message "SN is invalid. (Error code:4)" will pop up. The "Offline Tool" in the newly exported "OfflinePack" folder has been executed more than once. Please note that the "OfflinePack" can be used only once. 1. Export a new "OfflinePack" and follow the Offline Activation instructions again. 2. If the issue persists, please contact us at eHelpdesk.